Wanted: antiques for The Drawing Room of Newport and The Zsolnay Store of Newport, Rhode Island. Below you will find photos and descriptions of items that we are interested in acquiring. If you have a similar item and wish to sell it to us, just email us with a description of age, size and price. We will respond as soon as possible. 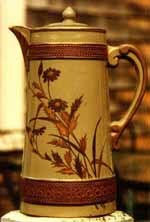 We are always interested in purchasing high style Secession examples of Zsolnay ceramics from Pécs, Hungary. We travel to Europe frequently and can make arrangements to meet you overseas. #3255. Pictured is a mid-19th Century Veilleuse; either French or Russian. Unmarked. We are always interested in purchasing antique ( be careful of reproductions) Veilleuse, especially in the forms of people and animals or ones with Gothis decorations. Any lamps with bases like the ones pictured. Usually unmarked and unsigned. The ones to the left were kerosene. Most are between 24" and 30" tall. 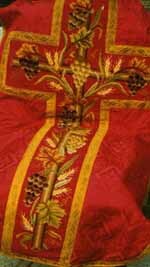 Religious tapestries, chasubles: needlework with silk or gold and silver thread. Prefer 18th and 19 th century. 2-5/8" (fitter opening) gas shades, c. 1870. 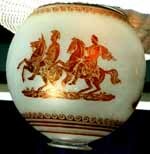 Red or orange flash, acid etched, Roman themes: chariots, soldiers,etc. 3", 4" and 5" (fitter opening) gas shades with aesthetic designs with red or orange flash color design. 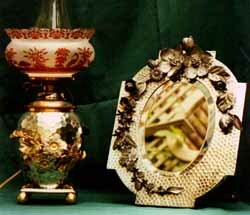 American Aesthetic period ( 1880's ) white metal and silver plated decorative objects as shown above: kerosene table lamps, mirrors,etc. Original finish preferred. American Silver Plate kerosene table lamps from the aesthetic era ( 1880's). Condition important. 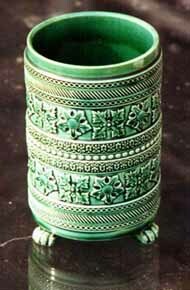 American Aesthetic pottery in this style: about 6" tall ( size can vary). usually unmarked. Glazed American pottery in this form or design. Usually about 6" to 10" tall. Colors: olive green to turquoise. Usually unmarked. Imperial Breast Stars and Badges from European Countries: Austria, Hungary, Germany, Italy, Serbia,etc. American Pottery covered "coffee" pots. The ground is usually putty color with dull gilt decorations. Usually unmarked and comes with various leaf and flower decorations. 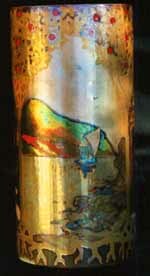 The list of links below take you to individual pages within our online gallery of fine antiques for sale.